Siblings Thomas and Beth Hale have been awarded for their courage and bravery while one of them battled against the rare eye cancer retinoblastoma. Thomas was just seven months old when he was diagnosed with the condition, which meant that he needed to have intensive treatment to combat tumours in both of his eyes. Doctors were able to save his eyes, although he was left with limited sight and will continue to be monitored for the rest of his life. Despite the day to day challenges which face Thomas, now seven, he strives to live life to the full with help from his 11-year old sister Beth who provides her little brother – not to mention her parents – with unrelenting support. 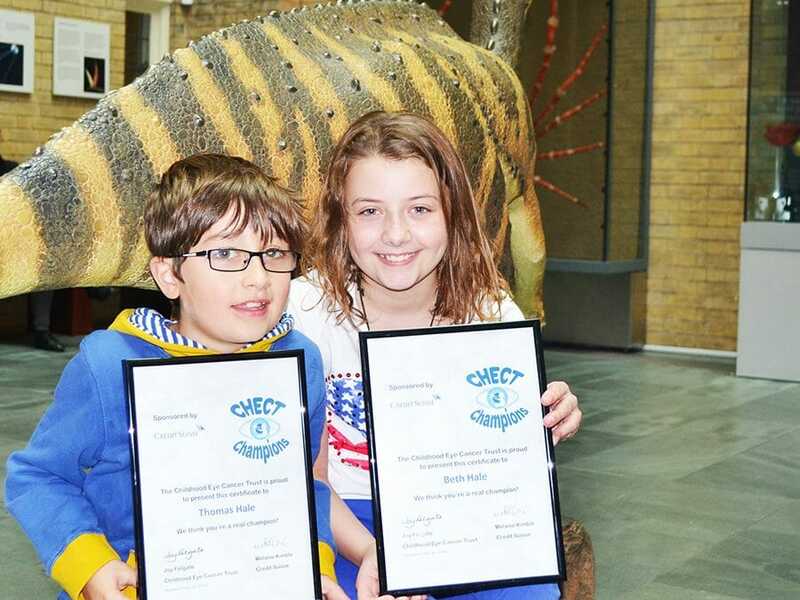 In recognition of Thomas and Beth’s outstanding efforts in the face of adversity both children have been named as CHECT Champions. Their mum, Liz Hale, from Halifax, says: “I am just so proud of both of them. Thomas’ greatest strength is that he gets on with life in such a normal way that nobody would ever guess he had retinoblastoma and went through months and months of treatment. Liz adds: “Beth was only four years old when Thomas was diagnosed but she was always really understanding and accommodating. Thomas had to go to Birmingham for treatment which meant we were away a lot. “She spent a lot of time staying with grandparents, her aunt and friends and she never complained about all the disruption to her routine. The CHECT Champion awards aim to recognise the courage, resilience and patience shown by all children affected by retinoblastoma throughout treatment and beyond. Each child receives a medal together with a framed certificate and goody bag. If you would like to nominate a child to be the next CHECT Champion please download a nomination form. The next awards ceremony will be held during our members’ day at the National Space Centre in Leicester on Sunday 6 December. To find out more about this event, please email our development manager Matt Croxall at matthew.croxall@chect.org.uk or call him on: 07821 649965.